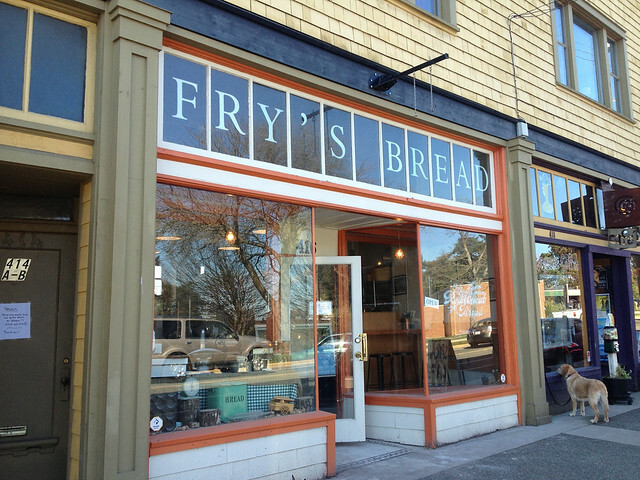 Fry's Bakery opened up not so long ago on Craigflower (right in the middle of that annoying 30 km stretch) after building up a regular collection of fans at the Downtown Public Market of the last few years. 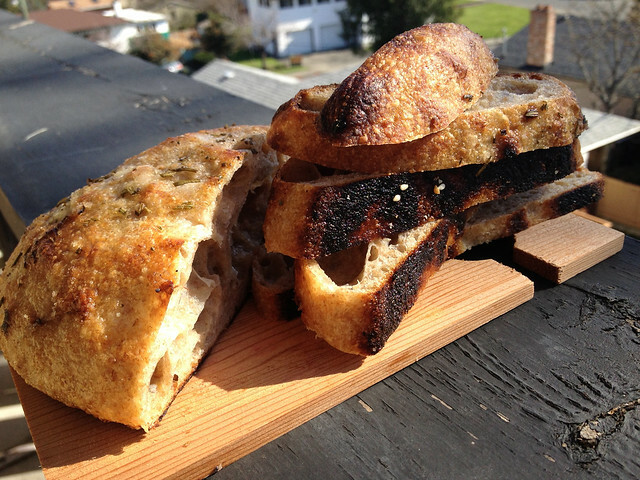 His story is pretty stellar: a photographer by trade he became obsessed with baking bread. Then he discovered his Grandfather had been a baker, too! In fact, his Grandfather had a shop a stones throw from where his new bakery stands today. Not only that, but his Grandfather baked using Red Fife Wheat, but in the interim the grain fell out of fashion and nearly went extinct! Thanks to the work of activism by Slow Food Byron now uses the heritage grain to make his tasty tasty loaves every day... and now, using the original logo everything has come full circle. The location is extremely utilitarian, but adorable: the majority is (as it should be!) taken up by the bakery, with a small case stocking other local products, a selection of daily pastries and a large wall of freshly-baked bread. Below that sits bags of goodies set aside for customers coming by later in the day. The menu - and there is one - focuses on which days certain ingredients are baked to help ensure you do not leave disappointed any more than once. For a food culture where "gluten free" is trending like breaking news on Twitter Byron Fry's bread will make the midly-intolerant weaken (which is totally legit because Red Fife is naturally low in gluten!). I have to confess, I had this for the first time at a Slow Food meeting and I have been craving it like Crazy ever since. There's something about the combination of oil, herbs & the red fife flour that made my taste buds go absolutely crazy! I am secretly stoked that this Saturday is once again my turn for an early-morning dog walk so I can combine another leisurely stroll in the park with a stop at the bakery. I had the other shape of foccacia the first time (blanking on what it's called, but it was longer and flatter in shape) and I have to say, I think I preferred it although they were both delicious. I am not sure if there was any difference other than surface area... but this one did get turned into tasty mini-sandwich bread which would not have been as possible with the other shape. 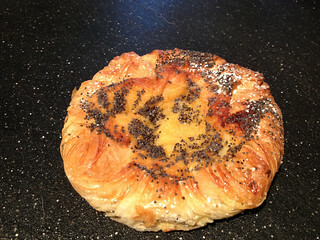 After having a plum danish (Slow Food meeting again...) I was stoked to pick up some pastries for breakfast the next morning. What makes me happy is that unlike some danishes where all you can taste is sickly-sweet icing sugar flavour, these ones are very savoury. 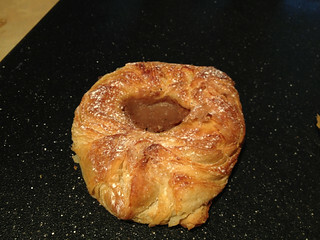 I think the difference is that the pastry is more savoury, and the sweetness comes from the centre flavoured part instead. I suspect these change on a regular basis, as there were no plum ones the day I visited (sadface...) but these two were both delicious! The only thing I wished for was a bit more coffee creme, as when we split them into quarters to share the center part was a bit on the small side. Mr. Fry was just taking off as I arrived, as it was mid-afternoon and he had probably been up since dawn baking away, but the woman behind the counter who served me was extremely pleasant and friendly.